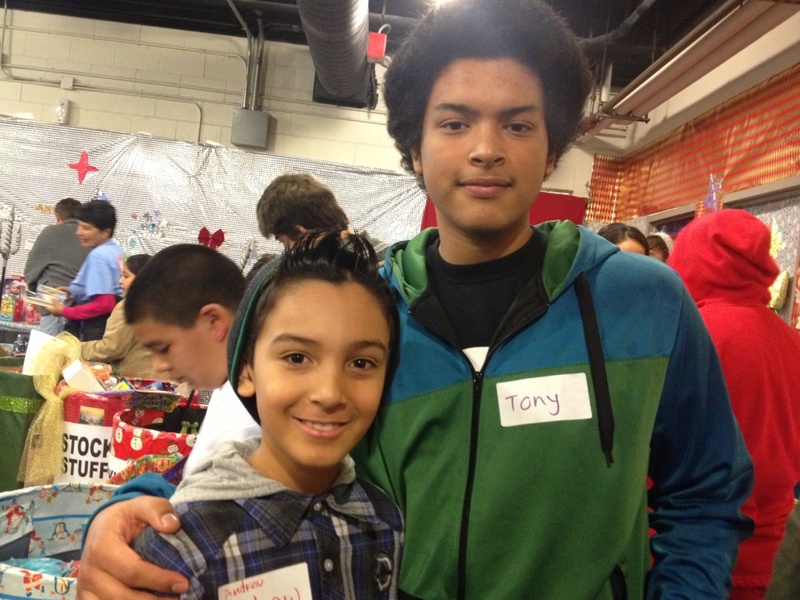 Tony Gasco (right) and his little brother Andrew Veliz traded in Christmas morning at home to volunteer at The Midnight Mission's toy give away. Christmas is just eight days away, and kids are eagerly awaiting the latest goodies from Santa. But the holidays are more than just about gifts. For parents who want to get young children involved with volunteering, there's a new website helping make those connections. Project Giving Kids maps out activities like making card for seniors to planning a dog biscuit sale to raise money for animals in need. The website right now only services the Boston area, but gives parents in other cities some ideas on how to involve kids in charity work. Creator Molly Yuska joins the show to talk about how to get your kids involved in charity work. Why it was important to get kids involved with community projects? "For me it was a very personal thing. I have three kids under the age of ten and as parent I think it's my responsibility to teach them that the world is bigger than what they see out there on the front door. And I think one of the best ways to do that as a parent is to expose them to people whose lives are very different than their own, and so for me it started with trying to find ways for my kids to connect with organizations and opportunities in our local area and realize how hard it was to do that when you're a busy parent. So Project Giving Kids is really an outgrowth of that personal quest to find that information and trying to make that more readily available for kids and for parents." What activities can they get involved with even when they have busy schedules? "I'm so glad you asked that because that was part of the reality I was seeing for myself and for my friends with small children is that time is hard to come by, especially when you have little kids and so when we built out Project Giving Kids there's an activity section that allows families to filter by time so if you are looking for an activity that you can execute in 30 minutes or you're looking for something that's a little bit more involved, you can find something that would work for your family given where you are on that day with the constraints that you have around your busy schedule. "So I think that's part of it, is making it actionable for people where they are and I think there are some great things, especially for young kids. It doesn't have to be a really profound moment of engagement. It can be as simple as making cards for elderly folks at holiday times and taking those to the nursing home and handing those out or doing something tied to their birthday, whether it's a book instead of a gift for kids at a local shelter, whatever the case may be. There are ways to make actionable, it's just a matter of figuring out what those are and finding things that fit within the busy family lifestyle." "We set it up so kids could actually be the drivers of that conversation in dialogue within the family structure. So kids can get to ideas based on areas of interest like aid the animals, comfort the sick, help other kids and there's a pass to get to activity projects based upon that. There's also an ability to go into the activities tab and filter both based on cause as well as time as well as where those activities can be done from. Whether there's things you can do from home, whether there are things you do out in the community and so there are really filters there that allow people to pick and choose based upon what's more important to them or what's most practical to them." How do you get kids involved in something so big? "It's making it seem like an actionable, everyday part of life and I think what I have witness with my own children is that those opportunities where they have really been able to see the impact of what they have done has resonated in a way that has made them naturally long for more of that, and yes, do you have to facilitate as a parent? Of course. "But I do think that on our side we're looking for fun things that things are going to want to do and we have also set up a way for kids to join teams and score points for doing service projects and there's no culminating prize for the kid other than the gratitude and excitement of being a part of winning team and then a donation when we hit that point will go to a charity on our site so I think you have to be creative. We have tried to do that through the website experience, but as a parent you have to be sure you're picking things that you know your kids are going to find enjoyable." Any idea when the site will expand to other cities? "I wish I knew the answer to that. It's really going to be a function of interest and of our own financial reality. We're looking for donors who are interested in bringing us to new communities and it's certainly part of our strategic plan. I think all technology, especially technology that's serving a greater good, should be leveraged to the greatest exempt possible and that's certainly part of what we're aiming for. Don't have an exact answer for you on that because it really is a function of interest and financing."